We’ve been here in France a little over a week now. 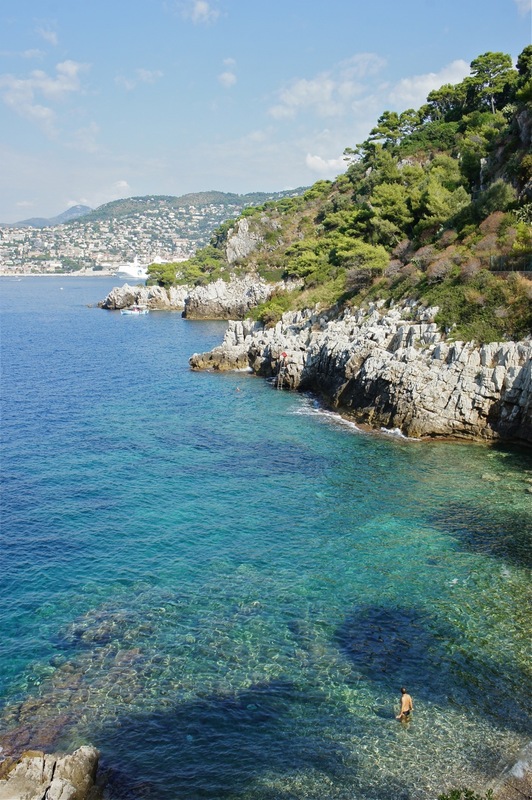 This trip being free of agendas the days have been easy: we’ve hiked around the peninsula of St. Jean Cap Ferrat. 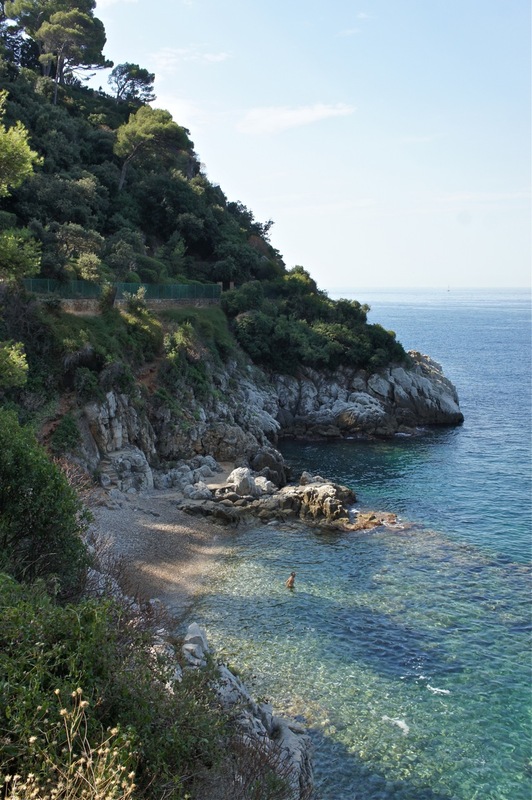 We’ve taken a couple of side trips to Nice and Antibes for a change of scenery but these hikes along the coastline have monopolized our time in a very nice way. 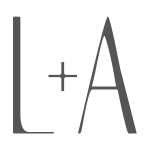 There are two routes, the shorter St. Jean Cap Ferrat loop and the twice longer Cap Ferrat hike which we just discovered on this trip. Both start just steps away from our hotel, on the beach, with a rewarding finish, again on the beach. The concrete path overlooks the Mediterranean and though most of this peninsula is rocky, it hasn’t kept loyal sun/water worshippers from enjoying these warm days we’ve had. If there’s a way into the water, you can bet that it will have been discovered. What’s nice is that save for the occasional hiker passing through on the path above, these people have found their own private oasis for the day. You can see what I mean with the first two pictures. About a mile in from the hike path this beach awaits. If you like solitude like I assume this gentleman does, he found the perfect place on this tiny beach. My husband and I have planned a day to pack a bag and find our own little pockets of paradise along the trail. All we’d need are our hats, sunblock, towel, water and a sandwich. Sandwiches are the thing to eat on the beach here. Being so close to Nice, pan bagnats (a Nicoise salad-type sandwich) are very popular here but so are simpler meat and cheese sandwiches. Rows and rows of sandwiches line the front counters of bread shops in the morning and you’d be lucky to find any left by mid-afternoon. On the Riviera I’d say most of them end up as lunch on the beach. And speaking of sandwiches, here’s one that I couldn’t get enough of at home recently. I’ve dressed it up for afternoon tea here but there’s no reason not to enjoy it at the beach, too. 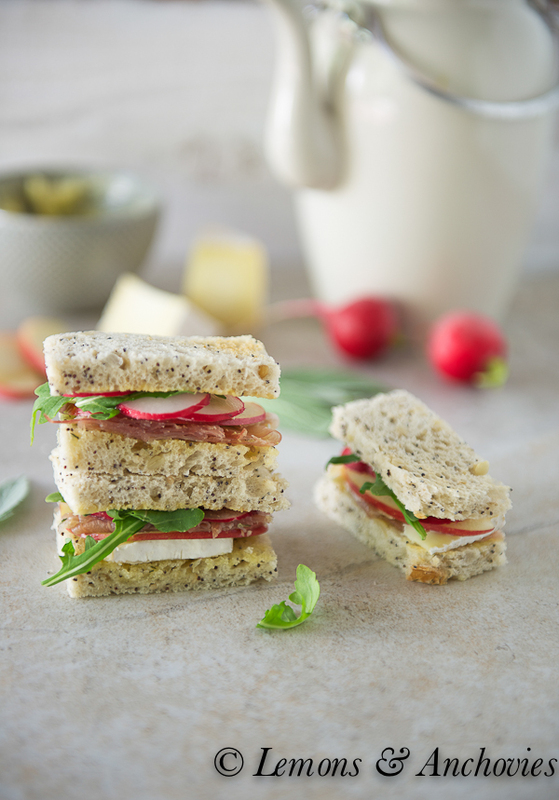 Prosciutto, brie, apple slices and peppery radish and arugula go quite well together here, especially with a little sage butter slathered on the lightly-toasted sourdough bread. Feel free to use your favorite sliced bread or rustic loaf–you can’t go wrong here, but don’t skip the sage butter! 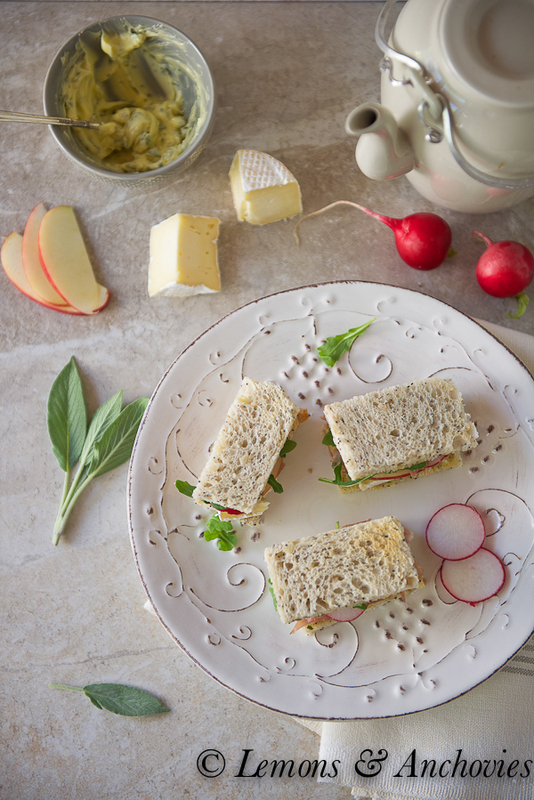 These delicate little sandwiches would be a nice accompaniment to tea or cocktail hour. Prepare the sage butter: It's best to use softened butter here. Allow yours to sit on the counter at room temperature before stirring in the chopped sage leaves. Set aside. Assemble the sandwiches: I used store-bought sliced sourdough bread which come in a regular square size. I trimmed the ends, assembled the sandwiches and divided each full sandwich into three rectangular tea sandwiches. 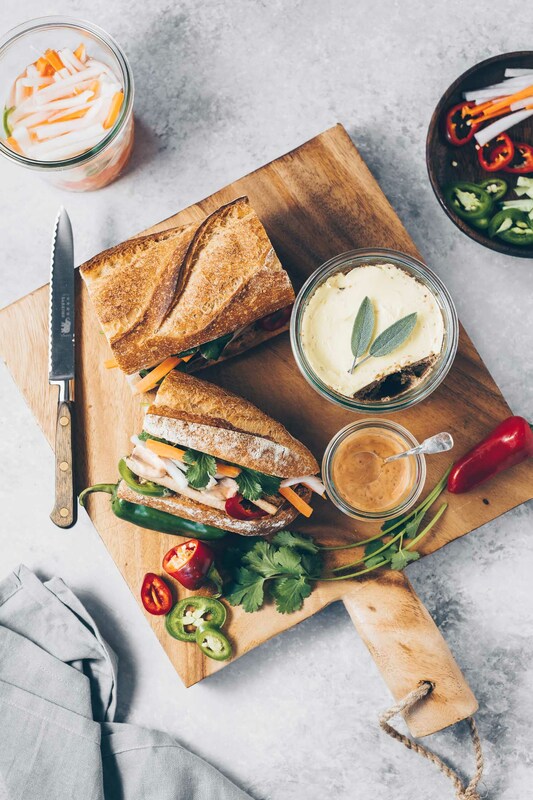 Allow three tea sandwiches per person (1 full sandwich). Begin by spreading the sage butter on the bread. 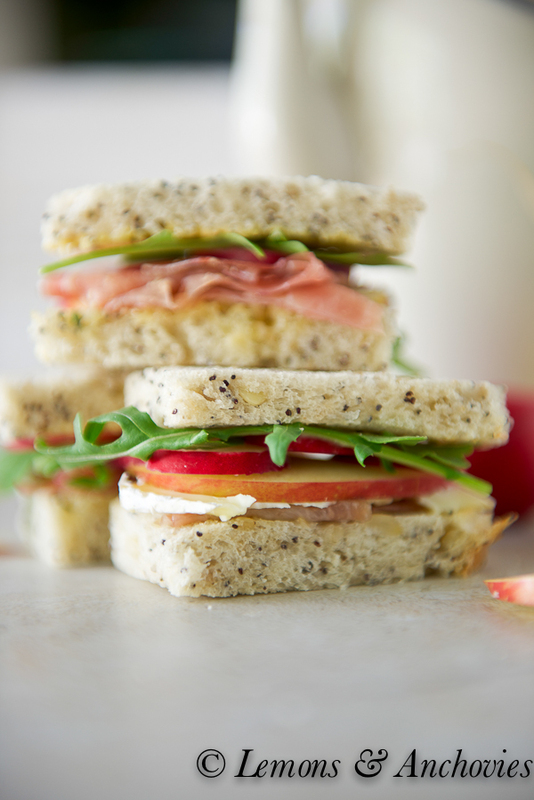 Add the prosciutto and layer the other ingredients--apple slices, brie, radishes and arugula. Serve with tea or cocktails. Note: I toasted my bread lightly before using. I thought about you this week – work is quite busy with several timelines that are due and I just kept wishing a transporter of sorts would whisk me away to the South of France and have not worries. I am glad that you are having a great time on your trip – you certainly deserve it along with hubby! 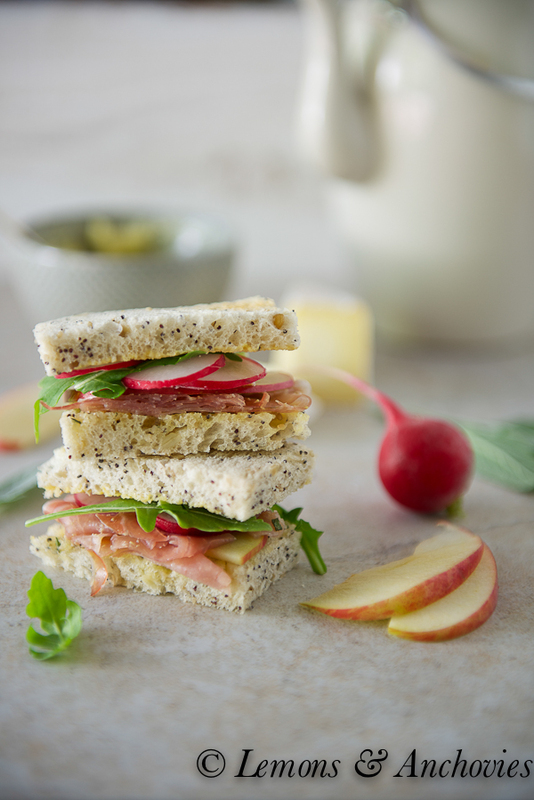 The tea sandwiches are simply perfect and stunning photos!!! 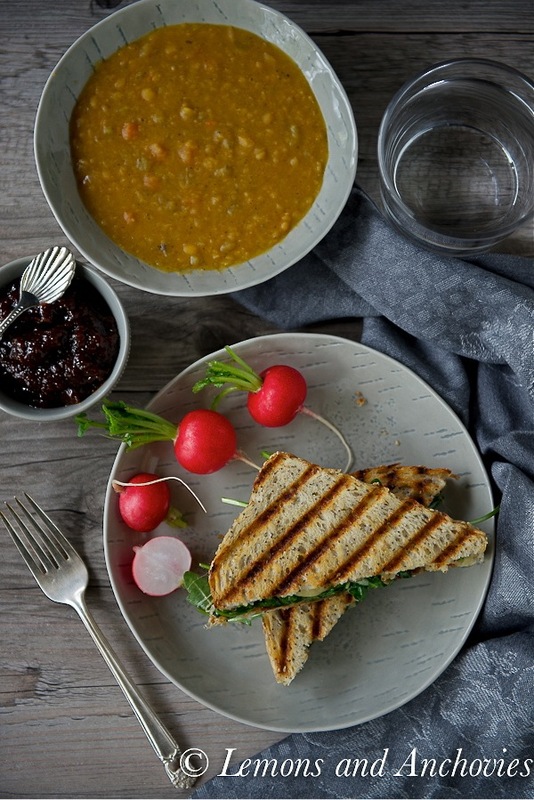 What wonderful sandwiches (yes please to sage butter!). Now if only I had your beach view to go with! Wonderful sandwiches! I really love that combination of flavors. Beautiful seaside and azure water! Breathtaking views! How wonderful to have it all to yourselves (mostly)! *Love* the precious sandwiches too!! While I love everything about your tasty little tea sandwich, all the photos of the water you have been teasing us with are the show stoppers. Hope you are enjoying your trip. Magnificent images! Such spectacular view! 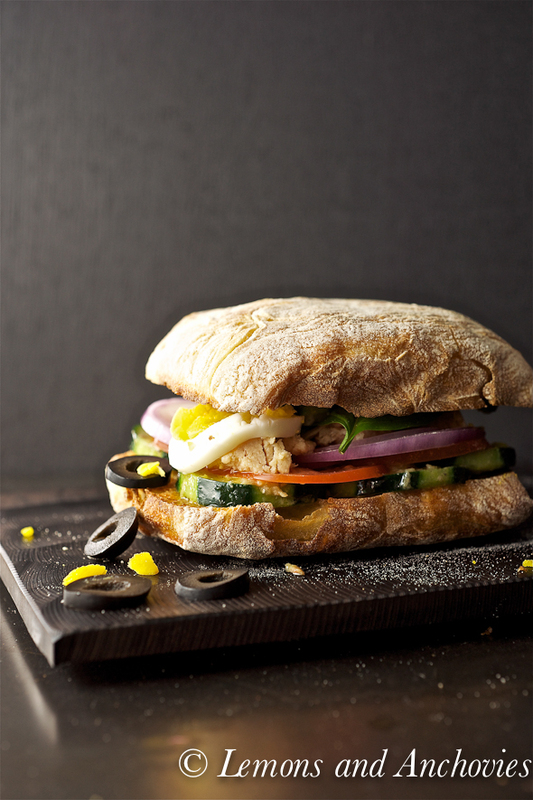 And that sunshine-y, fresh goodies stuffed towering sandwich…killer! Stunner! That area of France looks amazing to visit. This does sound like a great little beach treat. I would also think of this as a nice after school lunch. The flavors of these different ingredients go so well together. Thanks for sharing!